I-Fit Foam Wrist Support (7in.) – Pacific Medical, Inc.
Anatomically designed for Carpal Tunnel Syndrome, general sprains and strains. 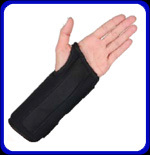 Lightweight foam brace provides comfortable support.